A 20 percent chance of showers before 7pm. Cloudy, then gradually becoming partly cloudy, with a low around 31. East wind 5 to 7 mph becoming light and variable after midnight. A 10 percent chance of showers and thunderstorms after 3pm. Mostly sunny, with a high near 58. Light and variable wind becoming east 5 to 7 mph in the morning. Mostly clear, with a low around 36. 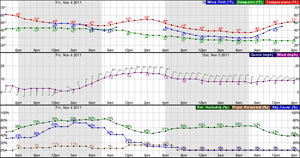 Light and variable wind becoming west around 6 mph after midnight. A 30 percent chance of showers after noon. Increasing clouds, with a high near 62. West wind around 6 mph becoming northeast in the morning. A 30 percent chance of showers before midnight. Mostly cloudy, with a low around 39. West northwest wind 5 to 7 mph. A 20 percent chance of showers after noon. Partly sunny, with a high near 63.